Although Skye has some of the most dramatic landscapes in the UK, Braes is well down the list of must-see geological venues. But take time to explore and many of the features that attract all the attention are here but on a different scale. Volcanoes. Braes sits on the edge of a magma chamber that once lay beneath a volcanic system that has long since eroded away. The Red and Black Cuillin formed part of that chamber. Glamaig dominates the view to the south of Braes. The lavas that built the Trotternish peninsula are thought to have welled out from great cracks or fissures in the earth’s crust. Landslips. The landslides of the Trotternish escarpment comprise cliffs of basalt lava flows overlying sedimentary rocks and a thick layer of igneous rock. The underlying sediments moved under the weight of the lavas which lead to the landslips. This feature extends from the north east of Skye down through Braes as far as Camustianavaig. The landslip east of the summit of Ben Tianavaig is unstable. The toe of the landslip is gradually being removed by the sea. The tilted plateaus of basalt result in a ‘stepped’ landscape. This feature can be seen to varying degrees throughout Braes. Dykes, sills and plugs. All different types of igneous intrusions. A dyke cuts vertically across the layers of its surroundings. Molten lava does not always make it to the surface and this is called a plug. Erosion may eventually expose the harder rock. When an intrusion cuts horizontally along the bedding planes, it is called a sill. Dykes are generally vertical and sills horizontal. 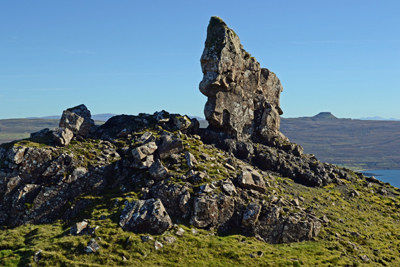 Many rock layers on Skye are affected by a major swarm of dykes, mostly of basalt. The dominant trend of the dykes is northwest-southeast although they are partly radial near the old volcanic centre. Dykes can be found above the shore in Gedintailor and Balmeanach. Tombolo and raised beach. An Aird is linked to the coast by an unusual gravel spit, a raised tombolo. This is part of a raised beach that was formed between 8,000 and 6,500 years ago during a period of rapid rise in world sea level. The water level later receded leaving the beach exposed. Fossils. These are found in the exposures of sedimentary rocks that occur in a few locations below cliffs e.g. via the shore north of Camustianavaig Bay and Eilean Tioram. They can also be seen in loose boulders on the shore, and are often exposed due to the erosion effects of the sea. Shingle bank or spit. The shingle bank at An Corran, opposite Sconser, has been formed by a combination of tidal effects, wind and outflows from Sligachan River through the loch. Beach. Sandy beaches are not common on Skye but at mid to low tides we have one! The curved bay of Camas a Mhor-bheoil is a perfect collector of stones from eroded rocks around the Skye coastline. Coal seams. In the 18th/19th centuries attempts were made to extract lignite from narrow seams in two locations in Braes. But the resource was limited and did not prove to be commercially viable. At Camas Ban, in the crags above the west side of the bay the partially collapsed entrance to the drift mine may be examined at the base. Waterfalls. The stepped landscape has resulted in many waterfalls as burns drop towards the sea. Here is a selection to choose from: Allt Ossian, Camustianavaig – Ollach River (Coille Iosal) – Lon Salach (Upper Ollach) – Allt Garbh Beag (path to Sligachan) – Scorr. - Glamaig from Balmeanach, cloud courtesy of the weather! - A view of Ben Tianavaig and pinnacles on the landslip taken from the beach. - Below.. a closer view of a stack which you can just pick out in the view of the Ben. - Part of the tombolo appears in the changing banner gallery. - Stone with fossil imprints, found on the beach in 2015 but not seen since! - The sandy beach; blue skies do happen. - The main waterfall on the Ollach River.